Good news for Strong Bad fans, our friends at Telltale Games have just confirmed to us that Strong Bad Episode 2 is due to be released in the USA on Monday 15th September on WiiWare. Join the republic of Strong Badia! There is no news on the European / Australian date yet, technically it should be the 26th September in the next fortnightly WiiWare update unless NoE change their recent pattern. Following on from Homestar Ruiner, Strong Badia the Free is the second game in the Strong Bad's Cool Game for Attractive People series. The King of Town, not too pleased with Strong Bad's recent antics, has decided to institute an e-mail tax, causing Strong Bad to end up under house arrest with an explosive collar around his neck. After using his wits to break out of the house, Strong Bad must attempt to convince various exotic locales, such as Pompomerania, Concessionstan and the Homsar Reservation, to ally with his own Strong Badia (Of which the population is now just one, as even the Tire has abandoned Strong Bad), banding together in order to overthrow the King's tyrannical rule. Check out our gallery below for all the latest Strong Bad Episode 2 media. Don't forget that the bowl-shaped puzzler by the name of Potpourrii is also going to be released on Monday in the USA in addition to this! I'm rather surprised that they're bringing this second episode out so quickly. Hopefully Bomberman Blast will be released in addition. If not it shouldn't be too far off now. Frankly, I can't bring myself to care much for these Strong Bad episodes. The whole Homestar Runner stuff just doesn't appeal to me at all. shrugs Well, at least some people will have fun with it. i know a lot of people arent excited about this release... but I am!!! Yeah, monday!!! I thought Potpourri was coming out Monday. Do you think we get two Wiiware titles and and one VC game? Darnit, I don't have the blocks for this! Yes so far Potpourrii and Strong Bad Epidsode 2 are confirmed for Monday. We don't know if we'll get any VC games or possibly a third WiiWare title as Europe received. It'd be cool to have a 2 wiiware, 1(+) VC week for once! And for everyone who's like "Its out already?" Its supposed to be a monthly series. Episode 1 just got delayed a bunch. Its been a little over a month since the last one, just as planned. So time is just passing too fast for you. Maybe you should stop having so much fun! Also how positive are we that Potpourii is coming Monday? The fact that it was confirmed earlier then we usually get WiiWare confirmations threw me off and I figured the developer was just assuming it was coming Monday. The developer of Potpourii confirmed this with me personally. He was certain it would be out on Monday. Then again, with Nintendo you never know do you? People get surprised nowadays when a developer actually sticks to it's schedule, but Telltale has been doing this since the first Sam & Max episode. One of these days I would like to try the Strongbad games(starting w/Ep.1) I just don't want to have to take off 300 blocks of my current games to download it. OK, well I suppose the U.S ans us (tee-hee, funny), are pretty much drawing in luckiness now. I was hoping strongbad would be out here today, but oh well. Maybe we are upgrading to two VC and two WW every week now. With the amount of WW projects being completed Nintendo may have to up it. This means Nintendo will probably allow Telltale to meet their promise of monthly episode releases. Crossing my fingers this isn't a repeat of the Mega Man/Ys/SS2 fiasco. If this is a repeat of "VC-gate" I don't think Nintendo would get away with it so lightly. If we're getting 2 WW and 1 VC then lets hope we get Mega Man 2. Watch its a barrel of lies and we get ALL DIFFERENT KINDS of WiiWare games. I kinda doubt it. Nintendo's been pretty shrewd lately in terms of how they treat their longtime fans. They'll probably wager that only a few thousand of us even pay attention to these kind of press releases, so another VCgate wouldn't have an impact on the people who've been buying the Wii. @ battledevil789- Your post reminds me of this. YESSSSS. I'll probably get it next Friday, after the review and the school week. He does that in other posts to. I know people like that in real life so I just tune most of it out. If the gaming press at large were to jump on it then I would think... wait, this isn't the US election news. I guess your right. We are a bunch of love starved abused fans. Your comment on tuning people out could not be more appropiate considering your Neku avatar. Check out TWEWY people, its great! I've waited a while (early August) since getting my last card,. so maybe this will be the week. @LAA. 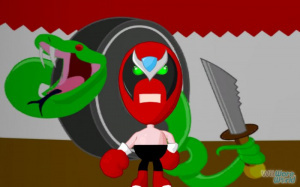 Wow, I'm soooooo sorry you got Bomberman, Plaatchen, and Maboshi, and no Strongbad. That must be so hard. Let me play you a sad song on the world's smallest violin. I don't want any of these games personally, but at least we're getting 2 games this time. Maybe this will start becoming a trend. Noooo (well not really). I only have 400 points But now I need to get Strong Bad, Megaman 9, and Bomberman Blast (assuming it comes to NA this month as well). Wiiware is a lot better than I had originally assumed it would be. Well since 2 WiiWare games are confirmed for next week on the 15th of Monday, it would be cool if we get a 3rd WiiWare game as well, that would be nice right and it would either be Bomberman Blast or Plattchen. I guess i can try the Potpourri game.. but i want to wait for the reviews first and see if its good and got good score too.. then if it does, ill go and download it and play it. Im thinking the 22nd will be Plattchen and Mega Man and the 29th will just be Bomberman. I want Plättchen and Bomberman to come out, but I have no hurry (since I wiil not have any money for wii points for awhile ). That could possibly be the worst math-reference I've ever seen in my life. I'm going with Supermario on that one. It was pretty bad. Great..... I bet we don't get any VC games this week, and the 3rd game is gonna be Platchen or Bomberman..... I haven't looked into potpourri, but I doubt I'll be downloading anything this week.... I'm waiting on World of Goo, Eternity's Child, Mega Man 9 and Animales De La Muerte.